For the earlier, non-variable-sweep wing bomber, see Tu-22. The Tupolev Tu-22M (Russian: Туполев Ту-22М; NATO reporting name: Backfire) is a supersonic, variable-sweep wing, long-range strategic and maritime strike bomber developed by the Tupolev Design Bureau. According to some sources, the bomber was believed to be designated Tu-26 at one time. During the Cold War, the Tu-22M was operated by the Soviet Air Forces (VVS) in a missile carrier strategic bombing role, and by the Soviet Naval Aviation (Aviacija Vojenno-Morskogo Flota, AVMF) in a long-range maritime anti-shipping role. Significant numbers remain in service with the Russian Air Force, and as of 2014 more than 100 Tu-22Ms are in use. 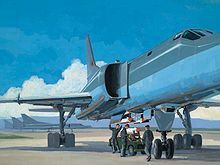 A painting depicting the loading of Raduga Kh-15 missiles on a Tu-22M rotary launcher. The bomber depicted is an early Tu-22M2, with distinctive air intakes. In 1962, with the introduction of the Tu-22, it became increasingly clear that the aircraft was inadequate in its role as a bomber. In addition to widespread unserviceability and maintenance issues, the Tu-22's handling characteristics proved to be dangerous. Its landing speed was some 100 km/h (60 mph) greater than previous bombers and it had a tendency to pitch up and strike its tail upon landing. It was difficult to fly, and had poor all-round visibility. In 1962, Tupolev commenced work on major update of the Tu-22. Initially, the bureau planned to add a variable-sweep wing and uprated engines into the updated design. The design was tested at TsAGI's wind tunnels at Zhukovsky. During this time, Sukhoi, traditionally a designer of fighter aircraft, developed the T-4, a four-engine titanium aircraft with canards. A response to the XB-70, it was to have a cruise speed of 3,200 km/h (2,000 mph), requiring a massive research effort in order to develop the requisite technologies. Not to be outdone, Tupolev, whose expertise is with bombers, offered the Soviet Air Force (Voyenno-Vozdushnye Sily, VVS) a massively updated version of the Tu-22. An initial attempt at modernizing the Tu-22M, Adaptation-45.03M, based around modernising the aircraft's radar, began in 1990, but was abandoned before reaching production. In 2007, work began on a new radar for the Tu-22M, the NV-45, which was first flown on a Tu-22M in 2008, with four more repaired Tu-22Ms refitted with NV-45 radars in 2014–2015. A contract for a full mid-life upgrade, the Tu-22M3M was signed in September 2014. The aircraft is to receive a further modified NV-45M radar, together with new navigation equipment and a modified flight control system. A new self-defense electronic radar suit is fitted, replacing the tail gun of the existing Tu-22M3. Much of the new avionics are shared with the upgraded Tu-160M2. Armament is planned to be enhanced by adding the new Kh-32 missile, a heavily modified version of the current Kh-22, the subsonic Kh-SD, the hypersonic Kh-MT, or the Kh-47M2 Kinzhal missiles. Deliveries of the Tu-22M3M are expected to begin in 2021. A separate, simpler, upgrade program (SVP-24-22) is being carried out by the company Gefest & T, based on avionics developed for the Sukhoi Su-24 attack aircraft, including a new computer, a new navigation system and digital processing for the aircraft's radar. The upgrade is claimed to greatly increase navigation accuracy and bomb delivery. A SVP-24-22-equipped Tu-22M underwent trials in 2009, and the program has been ordered into production, with deliveries from 2012. The two prototypes Tu-22M(0) were delivered to Long Range Aviation's 42nd Combat Training Centre at Dyagilevo (air base), near Ryazan, in February 1973. The aircraft began practice sorties in March. Within 20 days of the aircraft's delivery, the air and ground crew at the air base had received their type ratings; this was helped by their earlier training at Tupolev, the Gromov Flight Research Institute and the Kazan plant. In June that year, the aircraft were demonstrated to Soviet government officials, destroying tanks and armoured personnel carriers. The Tu-22M was first unveiled in 1980 during the aircraft's participation in a major Warsaw Pact exercise. During the exercise, naval Tu-22M2s conducted anti-ship operations by mining parts of the Baltic Sea to simulate an amphibious landing. The exercise was extensively covered by the press and TV media. In June 1981, four Tu-22Ms were intercepted and photographed by Norwegian aircraft flying over the Norwegian Sea. The first simulated attack by the Tu-22M against a NATO carrier group occurred between 30 September and 1 October 1982. Eight aircraft locked onto the U.S. task forces of USS Enterprise and USS Midway which were operating in the North Pacific. They came within 120 mi (200 km) of the task forces. The reaction of the U.S. Navy was thought to have been restrained during this event so as to allow the observation of the Tu-22M's tactics. The bomber also made attempts to test Japan's air defense boundary on several occasions. The Tu-22M was first used in combat in Afghanistan. It was deployed December 1987 to January 1988, during which the aircraft flew strike missions in support of the Soviet Army's attempt to relieve the Mujahideens' siege against the city of Khost. Two squadrons of aircraft from the 185th GvBAP based at Poltava were deployed to Maryy-2 air base in Turkmenistan. Capable of dropping large tonnages of conventional ordnance, the aircraft bombed enemy forts, bases and material supplies. In October 1988, the aircraft was again deployed against the Mujahideen. Sixteen Tu-22M3s were used to provide cover to Soviet forces that were pulling out of the country. The Tu-22Ms were tasked with destroying paths of access to Soviet forces, attacking enemy forces at night to prevent regrouping, and to attack incoming supplies from Iran and Pakistan. Working alongside 30 newly arrived MiG-27s, the aircraft also flew missions aimed at relieving the besieged city of Kandahar. The aircraft had its last Afghan operation in January 1989 at Salang pass. The Tu-22M suffered from widespread maintenance issues during its service with the Soviet forces. These stemmed from poor manufacturing quality. The engines and airframes in particular had low service lives. The Air Force at one point sought to prosecute Tupolev for allegedly rushing the inadequate designs of the Tu-22M and the Tu-160 into service. This was compounded by the government bureaucracy, which hampered the provision of spare parts to allow the servicing of the Tu-22M. With some aircraft grounded for up to six months, the mission-capable rate of the aircraft in August 1991 was around 30–40%. In August 2007, the Tu-22M and the Tu-95 began conducting long-range patrolling, for the first time since 1992. 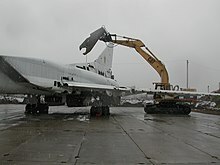 The Russian military acknowledged the loss of a Tu-22MR recon aircraft to Georgian air defences early in the 2008 South Ossetia war. One of its crew members was captured (Major Vyacheslav Malkov), two others were killed and the crew commander, Lt. Col. Aleksandr Koventsov, was missing in action as late as November 2011. On Good Friday night, 29 March 2013, two Tu-22M3 bombers were flying in international airspace in a simulated attack on Sweden. The Swedish air defense failed to respond. Two Tu-22Ms flew supersonic over the Baltic Sea on 24 March 2015. Two Tu-22Ms approached Öland in international airspace on 21 May 2015. The Swedish Air Force sent two Saab JAS 39 Gripen fighters to mark their presence. On 4 July 2015, two Tu-22Ms approached the Swedish island of Gotland without violating its airspace, followed by Swedish and other fighter aircraft. In 2014, Russian aerospace expert Piotr Butowski estimated there were seven squadrons of Tu-22Ms in service, each with approximately 10 aircraft, stationed at three airbases; 40 at Belaya airbase in southeastern Siberia, 28 at Shaykovka airbase southwest of Moscow, and 10 at Dyagilevo airbase in Ryazan southeast of Moscow which serves as the training unit for the bomber. With the deletion of the aircraft's in-flight refueling capability due to the START I treaty, the Tu-22M's internal fuel capacity limits its operational range (combat radius unrefueled: 4000-5000 km (DIA), 3360-3960 km (CIA) estimate) from its home bases to only around Russia's immediate sphere of influence. On 17 November 2015, as part of its air campaign in Syria, Russia used 12 Tu-22M3 bombers to hit targets in Syria, along with cruise missiles fired from the Mediterranean and Tu-95 and Tu-160 strategic bombers. 22–31 January 2016, Tu-22M3s reportedly conducted 42 sorties performing airstrikes in the vicinity of Deir ez-Zor city. On the morning of 12 July 2016, six Tu-22M3 bombers carried out a concentrated attack using high-explosive ammunition on Daesh targets east of Palmyra, Al-Sukhnah and Arak. On 14 July, six Tu-22M3 bombers having taken off from their base airfields in Russia delivered another massive strike on the newly detected IS facilities in the areas east of Palmyra, as well as in Al-Sukhnah, Arak and the T-3 oil pumping station in the province of Homs. New raids were conducted on 21 July, 8 August, 11 August, 14 August 2016. Since late January 2017, six Tu-22M3s resumed airstrikes in the area of Deir ez-zor to prevent capture of the city by jihadists and again in late 2017 to support government offensive. The Tupolev company has sought export customers for the Tu-22M since 1992, with possible customers including Iran, India and the People's Republic of China, but no sales have apparently been made. Unlike the Tu-22 bomber, Tu-22Ms were not exported to Middle East countries that were threatened by the US military presence in the region. During 2001, India signed a lease-to-buy contract for four Tu-22M aircraft for maritime reconnaissance and strike purposes. At the time, the aircraft were expected to be delivered with Raduga Kh-22 cruise missiles. The aircraft were not delivered to India. The later Tu-22M3 (NATO: Backfire-C), which first flew in 1977, introduced into operation in 1983 and officially entered service in 1989, had new NK-25 engines with substantially more power, wedge-shaped intake ramps similar to the MiG-25, wings with greater maximum sweep and a recontoured nose housing a new Almaz PNA (Planeta Nositel, izdeliye 030A) navigation/attack (NATO ‘Down Beat’) radar and NK-45 nav/attack system, which provides much-improved low-altitude flight. The aerodynamic changes increased its top speed to Mach 2.05 and its range by one third compared to the Tu-22M2. It has a revised tail turret with a single cannon, and provision for an internal rotary launcher for the Raduga Kh-15 missile, similar to the American AGM-69 SRAM. It was nicknamed Troika ('Trio' or third) in Russian service. 268 were built until 1993. As built, the Tu-22M included the provision for a retractable probe in the upper part of the nose for aerial refueling. The probe was reportedly removed as a result of the SALT negotiations, because with refueling it was considered an intercontinental range strategic bomber. The probe can be reinstated if needed. Tu-22M3s used to attack targets in Syria underwent modernization, during which the SVP-24-22 specialized computing subsystems were installed on them, significantly increased the accuracy of the bombing. The development of the “product 4510” began in 1983. Modernization with the installation of new engines NK-32 (from Tu-160) and with a change in engine air intakes. Modernization of avionics by installing a new PNK, radar "Overview" (from Tu-160), EW complex. Expansion of the range of weapons: 3 Kh-32 or 10 X-15 (with placement on 6 internal and 4 external points of suspension) or UPAB-1500 with a television guidance system. In 1990, a prototype was built at the Kazan aircraft factory. Works in this direction were discontinued in November 1991. The prototype aircraft No. 4504 is in the museum exposition of the AB Dyagilevo. Tu-22DP (Dal'nego Perekhvata, long-range interception)/ DP-1 is a long-range interceptor project based on the Tu-22M2 (later on the basis of the Tu-22M3). R & D was conducted by the AN Tupolev Design Bureau together with GosNIIAS. It was assumed that the DP could carry and strike weapons. This was a canceled projected civilian supersonic transport based on the Tu-22M3, calculated on 10-12 passengers. Developed in Tupolev Design Bureau (ANTK named after A. Tupolev) in the framework of conversion programs in the second half of the 1990s. The development of the aircraft began in the 1990s with the emergence in the world of interest and demand for supersonic business jets (SBJ). Since the creation of an aircraft from scratch requires large investments, the Tupolev decided to create an SBJ-class aircraft based on Tu-22M3. However, the project initially proved to be unpromising, as the aircraft was supposed to be used internationally, and then did not meet international environmental standards. Modernized Tu-22M3 of the Russian Air Force fitted with a new sighting and computing system SVP-24-22 Gefest, instead of the NK-45 Vachta-2 complex. The SVP-24-22 includes new more powerful onboard computer SV-24, UVV-MP-22 input-output device, flight information generation unit - BFI, aviation collimator indicator KAI-24, radio navigation system SRNS-24 with the A737 satellite receiver and the solid-state information storage device TBN-K-2 to save data of the navigation-targeting complex SVP-24 and of the flight recorder. 5 modernized aircraft entered service in 2015, 2 more in 2017, and one more in 2018. One more in 2019. Tu-22M3 for the Russian Air Force with engines from Tu-160M2 (NK-32-02), 80 percent of avionics are replaced or upgraded including SVP-24-22 bombsights, a phased array NV-45 radar, GLONASS navigation system, modern digital glass cockpit and engine controls and electronic warfare countermeasures, and the ability to use precision air-to-surface weapons. The Russian Ministry of Defense intends to upgrade up to 30 aircraft out of approximately 60 Tu-22M3s currently in service to the advanced Tu-22M3M variant. Can carry 3 Kh-32 or 4 Kh-47M2 Kinzhal missiles. Service life will be extended to 40-45 years. On 16 August 2018, the first modernized aircraft was unveiled during a roll-out ceremony at the Kazan Aviation Plant. It performed its maiden flight on 28 December 2018. Russian Naval Aviation – Tu-22M3s of the Northern Fleet and Pacific Fleet were transferred to the Russian Air Force in 2011. Soviet Air Forces – aircraft were transferred to Russian and Ukrainian Air Forces after the dissolution of the Soviet Union. A Ukrainian Tu-22M3 is dismantled in 2002 through assistance provided by the Cooperative Threat Reduction Program implemented by the Defense Threat Reduction Agency. Ukrainian Air Force and Navy inherited a large number of Tu-22M2/M3 bombers. 60 Tu-22Ms (17 Tu-22M2 and 43 Tu-22M3) and 423 Kh-22 cruise missiles were scrapped under the Nunn–Lugar Cooperative Threat Reduction agreement led by the US. The last bombers were scrapped in January 2006. 1 Tu-22M3 in the Poltava Museum of Long-Range and Strategic Aviation. 1 Tu-22M0, 1 Tu-22M2 and 1 Tu-22M3 in the Ukraine State Aviation Museum. On 9 August 2008, a Tu-22MR was shot down in South Ossettia by the Buk-M1 surface-to-air-missile system during the 5 day Russo-Georgian War. Three of the four crew members were killed. On 22 January 2019, a Tu-22M3 crash-landed after a training flight while attempting to make a landing at the Olenya (air base) near the city of Olenegorsk in Russia’s Murmansk region. Three of the four crew members died in the crash. A video shows the aircraft making a hard landing, which instantly ruptured the airframe and detached the forward cockpit area. Up to 6 × Kh-15 missiles on a MKU-6-1 rotary launcher in its bomb bay, plus 4 × Raduga Kh-15 missiles on two underwing pylons for a total of 10 missiles per aircraft. Various sea mines and freefall bombs – 69 × FAB-250 or 8 × FAB-1500 might be typical. The Kh-55 (AS-15 Kent) long-range cruise missile was tested on the Tu-22M but apparently not used in service. ^ "Ту-22М (Ту-22М2/Ту-22МЗ) -дальний бомбардировщик" [Tu-22 m (Tu-22 m 2/TU-22mz)-long-range bomber]. Oaokapo.ru (in Russian). Archived from the original on 31 July 2013. ^ Hoyle, Craig (26 September 2014). "Kings of the swingers: Top 13 swing-wing aircraft". Flightglobal.com. Archived from the original on 27 September 2014. Retrieved 27 September 2014. ^ a b Kandalov & Duffy 1996, p. 124. ^ a b Gordon, Rigmant & Komissarov 1999, p. 51. ^ Gordon, Rigmant & Komissarov 1999, pp. 51–52. ^ Gordon, Rigmant & Komissarov 1999, p. 52. ^ Kandalov & Duffy 1996, p. 158. ^ Eden, Paul, ed. Tupolev Tu-22/22M". Encyclopedia of Modern Military Aircraft. London: Amber Books, 2004. ISBN 1-904687-84-9. ^ "Tu-22M BACKFIRE (TUPOLEV)". Fas.org. Retrieved 24 November 2015. ^ "Источник: проектирование новой версии Ту-22М3 завершено" [Source: the design of the new version of the Tu-22M3 completed]. TASS. 17 November 2017. Retrieved 22 January 2019. ^ "Бомбардировщики Ту-22М3 вооружат гиперзвуковыми ракетами "Кинжал"". Ria.ru. 2 July 2018. Retrieved 16 August 2018. ^ a b Gordon, Rigmant & Komissarov 1999, p. 81. ^ Gordon, Rigmant & Komissarov 1999, p. 82. ^ "Military Exercises on Soviet-Bloc TV". New York Times. 14 September 1980. p. A5. ^ "Soviet planes photographed". The Globe and Mail. 15 June 1981. p. 14. ^ "Backfires attack US carriers". Flight International. Surrey, UK: IPC Transport Press. 122 (3837): 1480. 14–20 November 1982. ISSN 0015-3710. ^ Gordon, Rigmant & Komissarov 1999, pp. 83–84. ^ "USSR Uses Backfires, MiG-27s to Attack Afghan Mujahedeen". Aviation Week & Space Technology. New York: Penton Media. 129 (19): 21. 7 November 1988. ISSN 0005-2175. ^ Moseley, Ray (2 November 1988). "Soviets Add Missiles in Afghan War". Chicago Tribune. p. 16. ^ Gordon, Rigmant & Komissarov 1999, p. 84. ^ a b Velovich, Alexander (7–13 August 1991). "Spares deficit grounds Tu-22s" (PDF). Flight International. London, UK: Reed Business Information. 140 (4279): 17. ISSN 0015-3710. ^ Velovich, Alexander (6–12 November 1991). "Soviet AF wanted Tupolev prosecuted over Blackjack". Flight International. London, UK: Reed Business Information. 140 (4292): 21. ISSN 0015-3710. ^ "BACKFIRE BOMBERS IN CHINA" (PDF). Dtic.mil. Retrieved 16 August 2018. ^ Kramer, Andrew E. "Russia Resumes Patrols by Nuclear Bombers". The New York Times, 17 August 2007. Retrieved: 17 July 2010. ^ "Генштаб признал потерю двух самолетов в Южной Осетии" [The General staff acknowledged the loss of two aircraft in South Ossetia]. Lenta.ru (in Russian). 9 August 2008. Retrieved 9 August 2008. ^ Chang, Felix K. (13 August 2008). "Russia Resurgent: An Initial Look at Russian Military Performance in Georgia". Archived from the original on 14 October 2008. Retrieved 7 October 2008. ^ "Маленькая бедоносная война" [Little bedonosnaâ war] (in Russian). Moskovskij Komsomolets. 7 August 2009. Archived from the original on 11 August 2009. Retrieved 29 October 2009. ^ "RUSSIA/GEORGIA – Remains handed over by Georgia not of downed Russian pilot – source". Wikileaks.org. Retrieved 24 November 2015. ^ "Danish F-16s confronted Russian fighter jets approaching Sweden". The Copenhagen Post. April 23, 2013. Archived from the original on October 19, 2014. ^ Holmström, Mikael (22 April 2013). "Ryskt flyg övade anfall mot Sverige" [Russian aircraft practiced attacks on Sweden]. Svenska Dagbladet (in Swedish). Retrieved 24 November 2015. ^ Cenciotti, David (24 March 2015). "Russian Tu-22 bomber scares NATO air defenses flying at supersonic speed over the Baltic Sea for the first time". The Aviationist. Retrieved 24 November 2015. ^ Cenciotti, David (21 May 2015). "Ryskt agerande tvingar MP till vägval" [Russian action forces the MP to choices]. Svenska Dagbladet (in Swedish). Retrieved 24 November 2015. ^ de la Reguera, Eric (4 July 2015). "Ryska bombplan nära Gotland" [Russian bombers near Gotland]. Dagens Nyheter (in Swedish). Retrieved 24 November 2015. ^ "Tu-22M BACKFIRE (TUPOLEV)". www.globalsecurity.org. Retrieved 29 December 2018. ^ "Russian Warplanes Destroy 140 Terrorist Targets in Syria". Sputnik. 17 November 2015. Retrieved 24 November 2015. ^ Cenciotti, David (17 November 2015). "25 Russian long-range strategic bombers in action over Syria for the very first time". The Aviationist. Retrieved 24 November 2015. ^ "Russian Jets Carry Out 169 Sorties in Syria Hitting 484 Terrorist Targets". Sputniknews.com. Retrieved 16 August 2018. ^ "Russian Warplanes Destroy Over 1,300 Terrorist Targets in Syria in One Week". Sputniknews.com. Retrieved 16 August 2018. ^ "Russian Tu-22M3 Bombers Destroy Daesh Camp, Tanks & Militants in Syria". Sputniknews.com. Retrieved 16 August 2018. ^ "Russia's Tu-22M3 long-range bombers strike IS facilities in Syria". Tass.ru. Retrieved 16 August 2018. ^ "Six Russian Tu-22M3 Strategic Bombers Strike Daesh Targets in Syria". sputniknews.com. Retrieved 16 August 2018. ^ "Шесть Ту-22М3, вылетевшие из России, нанесли удар по объектам ИГ в Сирии". Ria.ru. 8 August 2016. Retrieved 16 August 2018. ^ "Опубликовано видео ударов ВКС по позициям ИГ в Ракке". Ria.ru. 11 August 2016. Retrieved 16 August 2018. ^ "Six Russian Tu-22M3 backfire long-range bombers deliver strikes on IS facilities in Syria". Tass.ru. Retrieved 16 August 2018. ^ "Syrian conflict: Russian bombers use Iran base for air strikes". BBC. 16 August 2016. Retrieved 16 August 2016. ^ "Russian Tu-22M3 Strategic Bombers Annihilate Daesh Targets in Deir ez-Zor". Ssputniknews.com. Retrieved 16 August 2018. ^ "Gov't Forces Destroy Last Daesh Stronghold in Syria, Army Command Confirms". Sputniknews.com. Retrieved 16 August 2018. ^ "Six Russian Tu-22M3 bombers hit Islamic State facilities near Syria's Abu Kamal". Tass.com. Retrieved 16 August 2018. ^ "Tu-22M simulated attack on U.S. aircraft carriers during cold war". 21 September 2011. Archived from the original on 2 October 2011. Retrieved 21 September 2011. ^ Wirtz, James (2004). Balance of Power. Stanford: Stanford University Press. ISBN 978-0-8047-5017-2. ^ Chopra, VD (2008). Significance of Indo-Russian Relations in 21st Century. Gyan Publishing. p. 130. ISBN 978-0-8047-5017-2. ^ "China buys Russian bombers". SpaceDaily.com. 23 January 2013. Retrieved 24 November 2015. ^ Cenciotti, David; Clements, Richard (20 January 2013). "China's Buying A Fleet Of Russian Bombers Perfect For Taking On The US Navy". Business Insider. Retrieved 24 November 2015. ^ "Никаких переговоров с Китаем о поставке бомбардировщиков Ту-22М3 не велось и не ведётся – "Рособоронэкспорт" [No talks with China on supplying Tu-22M3 bombers was not and is not-"Rosoboronexport"]. ITAR-TASS News Agency (in Russian). 24 January 2013. Retrieved 24 November 2015. ^ a b c d e "The Tupolev Tu-22 "Blinder" & Tu-22M "Backfire"". Airvectors.net. Retrieved 2016-09-15. ^ "Locked and Loaded: Russia's Tu-22M3 Bombers to Boast Advanced Cruise Missiles". Sputniknews.com. Retrieved 16 August 2018. ^ "Tu-22M3 - Cruise Missile - Missile". Scribd. Retrieved 29 December 2018. ^ Carlo, Kopp, (5 July 2007). "Tupolev Tu-22M3 Backfire C Bomber - Missile Carrier / Туполев Ту-22M3 Бомбардировщик-ракетоносец". Ausairpower.net. Retrieved 16 August 2018. ^ Kopp, Carlo (August 1, 2009). "Tupolev Tu-22M3 Backfire C Bomber – Missile Carrier". Ausairpower.net. ^ Taylor 1980, p. 212. ^ "Tupolev Tu-22M1". Riga Aviation Museum. Retrieved 24 November 2015. ^ "Новая система "Гефест" позволяет использовать некорректируемые боеприпасы как высокоточные". Tass.ru. Retrieved 16 August 2018. ^ a b "Ту-22М, сверхзвуковой бомбардировщик". ИА «Оружие России». Retrieved 22 January 2019. ^ Under the signs of "ANT" and "TU" // Aviation and Cosmonautics. - 2000. - # 11. ^ Turkey in an hour? Only 6 places! Archived 2010-09-11 at the Wayback Machine F5, April 17, 2009. - Interview with Alexander Leonidovich Pukhov, chief designer of the Tupolev Design Bureau. ^ "Tu-344". www.globalsecurity.org. Retrieved 22 January 2019. ^ "Russia brings into service modernized long-range bomber Tu-22M3". Tass. 4 June 2014. Retrieved 24 November 2015. ^ "В Национальном центре управления обороной проведен Единый день приемки военной продукции" [At the National Centre for defence management held a single day of acceptance of military products]. Armstrade.org (in Russian). 17 April 2015. Retrieved 24 November 2015. ^ "Quality building-up in the Russian Armed Forces". Eng.itogi2015.mil.ru. Archived from the original on 2016-06-29. Retrieved 2016-09-15. ^ "Tupolev hands over upgraded Tu-160M, Tu-95MSM strategic bombers". Airrecognition.com. Retrieved 16 August 2018. ^ "ЦАМТО / Новости / Очередной Ту-22М3 передан в эксплуатацию после завершения контрольно-восстановительных работ". Armstrade.org. Retrieved 16 August 2018. ^ "ЦАМТО / Новости / «Туполев» передал в эксплуатацию очередной Ту-22М3". Armstrade.org. Retrieved 16 August 2018. ^ a b Roblin, Sebastien (13 October 2018). "Bombs Away: Russia's 'New' Tu-22M3M Bomber Might Look Familiar (And Still Deadly)". The National Interest. Retrieved 29 December 2018. ^ Majumdar, Dave (18 November 2017). "Russia's Supersonic Bombers: Now Locked and Loaded with New Supersonic Missiles". Nationalinterest.org. Retrieved 16 August 2018. ^ Diplomat, Franz-Stefan Gady, The. "Russia Rolls Out First Upgraded Tu-22M3M Long-Range Bomber". The Diplomat. Retrieved 29 December 2018. ^ "Ту-22М3 сделают убийцу ЕвроПРО Ради высокоточной ракеты бомбардировщику поменяют всю электронику" [Tu-22M3 aircraft will be capable to overcome NATO air defence, it turns it into a high precision weapon system, all electronics of the aircraft will change]. VPK (in Russian). 7 February 2012. Retrieved 24 November 2015. ^ "Дальние ракетоносцы Ту-22М3 приземлятся в Крыму". Rg.ru. 18 March 2015. Retrieved 16 August 2018. ^ "Russia's upgraded strategic bomber to feature advanced avionics suite". TASS. Retrieved 29 December 2018. ^ "New bomber Tupolev-22M3M presented in Kazan". TASS. 16 August 2018. Retrieved 16 August 2018. ^ "Russia's upgraded Tu-22M3 strategic missile-carrying bomber performs debut flight". TASS. Retrieved 30 December 2018. ^ "43rd Center for Combat Employment and Retraining of Personnel DA". ww2.dk. Retrieved 27 January 2019. ^ "924th Guards Kievskiy Red Banner order of Suvorov Maritime Missile Aviation Regiment". ww2.dk. Retrieved 27 January 2019. ^ a b "13th Guards Dnepropetrovsko-Budapeshtskaya order of Suvorov Heavy Bomber Aviation Division". ww2.dk. Retrieved 27 January 2019. ^ "184th Guards Poltavsko-Berlinskiy Red Banner Heavy Bomber Aviation Regiment". ww2.dk. Retrieved 27 January 2019. ^ "5th Kirkenesskaya Red Banner Maritime Missile Aviation Division". ww2.dk. Retrieved 27 January 2019. ^ a b "2nd Guards Sevastopolskaya Maritime Missile Aviation Division imeni N.A. Tokarev". ww2.dk. Retrieved 27 January 2019. ^ a b "33rd Center for Combat Employment and Retraining of Personnel Aviation VMF imeni E.N. Preobrazhenskogo". ww2.dk. Retrieved 27 January 2019. ^ "Ukraine Bomber Decommissioning and Transfer Chronology" (PDF). Nuclear Threat Initiative. April 2005. Retrieved 21 January 2019. ^ "В ПОЛТАВЕ ГОТОВЯТСЯ К УТИЛИЗАЦИИ ПОСЛЕДНЕГО БОМБАРДИРОВЩИКА". aviaport.ru. 26 January 2006. Retrieved 21 January 2019. ^ "Украина ликвидировала последний бомбардировщик" [Ukraine eliminated the last bomber]. Korrespondent.net (in Russian). 27 January 2006. Retrieved 19 February 2018. ^ "22nd Guards Donbasskaya Red Banner Heavy Bomber Aviation Division". ww2.dk. Retrieved 27 January 2019. ^ "Музей дальней авиации" [Museum of long-range aviation]. doroga.ua (in Russian). Retrieved 24 November 2015. ^ "Грузия передала России тела штурманов сбитого Ту-22М3". lenta.ru (in Russian). 16 September 2008. Retrieved 2 October 2017. ^ "Самолет Ту-22 выкатился с полосы в Калужской области". iz.ru (in Russian). 16 September 2017. Retrieved 1 October 2017. ^ Rogoway, Tyler. "Dramatic Video Of Russian Tu-22M3 Crash Landing In Bad Weather Emerges (Updated)". The Drive. Retrieved 27 January 2019. ^ Frawley 2002, p. 163. ^ Donald 1997, p. 883. ^ Wilson 2000, p. 138. ^ "Russia tests strategic bomber with new air-to-surface missile". Tass.com. Retrieved 16 August 2018. ^ "Russian Tupolev Tu-22M3 long-range bombers practiced laying mines in maritime zones". Navyrecognition.com. Retrieved 16 August 2018. ^ "Kh-55 (AS-15 Kent/Kh-555/RKV-500/Kh-65)". Jane's Strategic Weapon Systems. 9 September 2008. Archived from the original on 4 February 2009. Retrieved 6 February 2009. Butowski, Piotr (March 2019). "Anti-carrier striker". Air International. Vol. 96 no. 3. pp. 44–47. ISSN 0306-5634. Donald, David, ed. "Tupolev Tu-22M". The Complete Encyclopedia of World Aircraft. Barnes & Noble Books, 1997. ISBN 0-7607-0592-5. Frawley, Gerald. "Tupolev Tu-22M". The International Directory of Military Aircraft, 2002/2003. Aerospace Publications, 2002. ISBN 1-875671-55-2. Gordon, Yefim; Rigmant, Vladimir; Komissarov, Dmitri (1999). Tupelov Tu-22 Blinder Tu-22M Backfire: Russia's Long Range Supersonic Bombers. Hinckley, UK: Midland Publishing. ISBN 1857800656. Kandalov, Andrei; Duffy, Paul (1996). Tupolev – The Man and His Aircraft: The Man and His Aircraft. Society of Automotive Engineers. ISBN 1560918993. Wikimedia Commons has media related to Tupolev Tu-22M.